When humans are under attack, our fight-or-flight reaction is triggered — and it turns out the same is true for plants too. UW-Madison/YouTubeThe fluorescent calcium wave shown in a plant after injury. New videos captured by researchers are changing the way that people look at plants. A study from the University of Wisconsin-Madison published on Sept. 14 in Science revealed that when a plant is injured, they release a nervous system-like signal throughout their body, similar to the pain response found in humans and other animals. When a human is injured, sensory cells in our bodies alert our nervous system to release the neurotransmitter glutamate. This stimulates a part of our brain to release adrenaline, which kicks our fight-or-flight response into gear. Plants don’t have nervous systems but video captured by the scientists behind this new study of injured plants shows that they do have their own version of fight-or-flight when they come under attack. The footage captured by the study’s scientists shows a caterpillar eating away at a plant and the plant’s subsequent response. Because they lack a nervous system, plants don’t have neurotransmitters, but they do still have glutamate. In the video, a plant is bitten by a caterpillar and releases glutamate at the bite site. This activates a calcium wave to rush through the plant’s entire body, which then triggers the plant to release their own stress hormone. The astounding video shows for the first time ever just how fast the plant’s response reverberates through their body. According to a statement from the University of Wisconsin-Madison, it takes less than two minutes for the signal to reach all ends of the plant, moving at a rate of about one millimeter per second. Once the plant has the signal blasted through its body, it now realizes that it is under attack and can properly respond to the threat. Scientists have been aware of this plant response for some time but were never able to capture the phenomenon or understand where it came from. 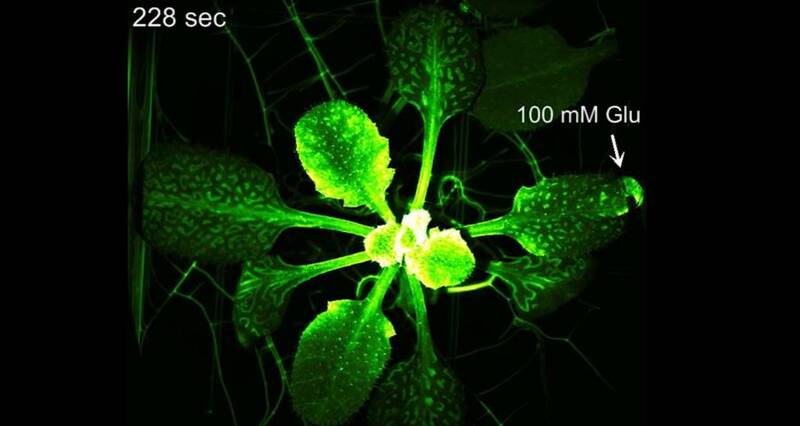 To be able to see what was happening inside of a plant when they are under attack, the researchers genetically modified them to make a protein that glows brightly around calcium. This allowed them to see the calcium wave that flowed through the plant after it was injured. 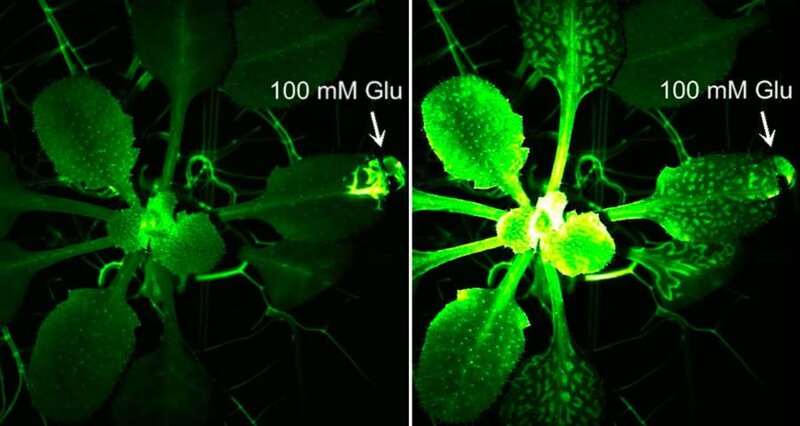 Footage captured by the study’s scientists showing the plant’s response to glutamate being directly applied to one of its leaves. The researchers used caterpillar bites, scissor snips, and crushing wounds to injure the plants and trigger their glutamate response. Once the plant’s warning signal response was sent throughout their entire body, the leaves began to release their defense-related hormones to guard them against any impending attacks. These defense hormones released include chemicals to jumpstart their repair process as well as noxious chemicals that ward off other predators. The plant’s response to injury is not quite the same as a human or other animal’s fight-or-flight response but it is their own version of it. So plants might not feel pain in the way that humans do, but this new discovery shows that they respond to injuries and attacks in a remarkably similar way. Next time you sit down to enjoy a nice, leafy salad, try not to think about all of the glutamate that the plants released along the way. Next, discover the most interesting plants on planet Earth. Then, meet the most extreme carnivorous plants from around the world.